Leveraging our wealth of standard components, our application and systems engineers work directly with customers at the engineering level, up front and early in the development process following our method of design definition to provide both the customer and Mini-Circuits with a proven framework to define requirements accurately ensuring a successful development effort. The following examples illustrate the range of capabilities. A fixed Frequency synthesizer including a micro controller that keeps the frequency locked within the range of 1050 to 1450 MHz. 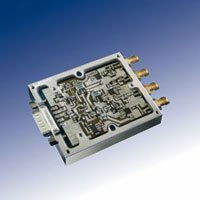 8 GHz synthesizer including a internal crystal reference oscillator with modulation input port for FM modulation of the carrier frequency. Features include 20 ms settling time. 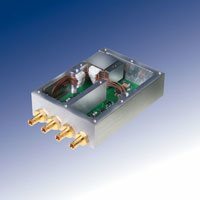 Active GPS, 1545 ‐ 1605MHz, three-way splitter for use in synchronizing base stations. Features 5dB, 0dB, and 0dB on each respective output port. Powered from outputs drawing 10mA and passing 100mA to the input with integrated, diode short-circuit protection on all outputs. 41-way unbalanced splitter for reference signal, 14 -16MHz, base station synchronization. 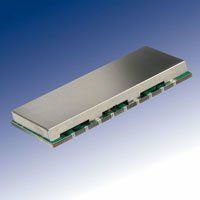 Features losses between 14dB and 26dB with integrated, low-pass filters that reject 800 – 2000MHz by 30dB and 40dB isolation between outputs ports. Provides signal monitoring for emergency location services. 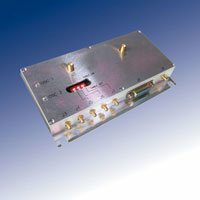 Designed with six, separate 10dB couplers, one for each sector of the base station with a low loss of 0.8dB, all mounted in ½ U rack-mounted case. 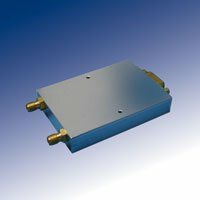 Satellite communications four-way splitter, supporting KA band 13.5 to 14.5GHz with insertion loss of 1.5dB, isolation of 20dB, and an ultra-small footprint of 0.25” x 0.25”. 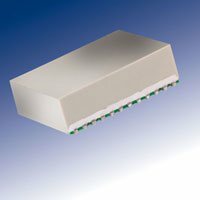 Tunable over the range of 100 to 450 MHz, this module includes an integrated X4 LO Multiplier and 70 dB input gain control to operate over a dynamic range set by 4 dB noise figure and input IP3 of +40 dBm. Integrated, LO and IF amplifier mixer assembly with high output IP3<31dBm, requiring LO drive of only 0dBm and providing gain of 9dB. For use in GSM 900 and 1800MHz base stations. 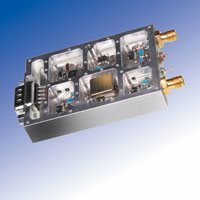 Integrated Vector Control Module for use in Military and Commercial Aircraft Communications covering 118 ‐ 137 MHz. 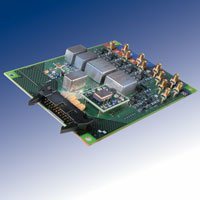 This module consists of 3 I/Q Modulators/Demodulators, 1 active with conversion gain of 13 dB, while all have performance of >30 dBc carrier rejection, with (2 deg.) phase unbalance and .3 dB amplitude unbalance. 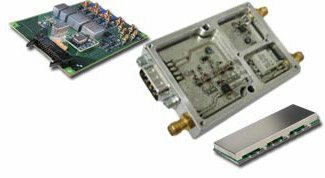 Satellite Communication Up Converter module, which converts IF frequencies of 40 ‐ 180 MHz to L-Band output of 950 ‐ 1750 MHz while suppressing spurs of > 65dBc over the entire L-Band Frequency. Features phase noise of >100 dBc/Hz at 100kHz offset and an ACPR of -55 dBc. 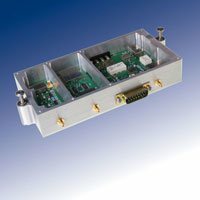 Incorporates monitoring ports for L-Band and IF, as well as a Mux-Tee that allows combining of 10 MHz reference and DC to be placed on the L-Band Signal. Active reference signal switch matrix for base station synchronization. Features two inputs feeding any one of four inputs. 3dB of gain and 60ns switching speed. Supports threshold detection with alarm function and manual bypass mode. 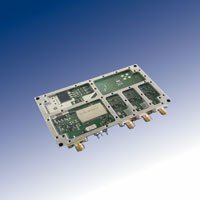 A broadband Amplifier module covering 500 - 2000 MHz having a very high gain >60 dB with gain control of 31.5 dB in 0.5dB increments. It has a noise figure of 2.8dB while giving an output IP3 of >30 dBm. 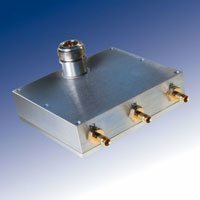 This product is ideal for a variable stage following the LNA in a Cellular, PCS and DCS Base stations as well as wideband receivers. 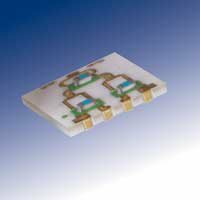 A wide band module, available in two frequency bands 2 to 30 MHz & 30 to 3000MHz. The module monitors power and generates a DC voltage which is proportional to the input signal level. Power output control is achieved by feeding the generated DC Voltage to control the internal digital step attenuator, which has 5 Steps: 5, 10, 15, 20 & 31. 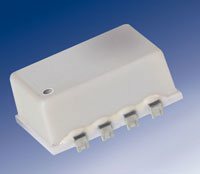 The module features an insertion loss of 2.0 dB max.